This post will soon become available in Spanish. Last year, I wrote about the 10,000th reptile and the 3,500th snake species to be described by scientists. The pace has not slowed down—as of its most recent update last week, The Reptile Database currently lists 3,596 species of snakes out of a total of 10,391 species of (non-avian) reptiles. 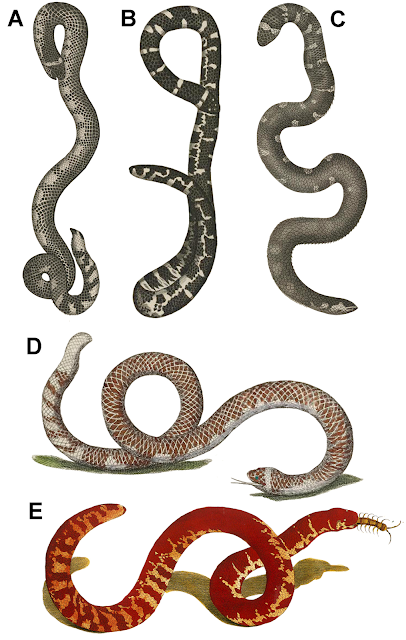 A few weeks ago, the March 21st issue of the frequently-published journal Zootaxa (volume 4093, issue 1) included descriptions of three of these new snake species. What's interesting is that I initially looked this issue up because I saw one of them being shared a lot on social media—a new large species of viper. The other two, a pipesnake and a blindsnake, hadn't received as much attention. Zootaxa tweets all of their new species, and an examination of their feed shows that the viper tweet received 4 retweets and 2 likes, whereas the pipesnake and the blindsnake received 2 retweets and one like each (even though the pipesnake had a photo1 and was on the cover). Even though that's a small sample size, I think it's telling that even snakes have their charismatic megafauna. and a tiger (Panthera tigris, bottom). It seems backwards, in a way, that the dangerously venomous viper should be more popular than the innocuous pipesnake. One conservation blogger, Corey Bradshaw, put it nicely by saying that "the only thing worse than being labelled deadly is not being called anything at all". Bradshaw pointed out that drawing attention to the potential for a species to cause harm to humans is not necessarily bad for the species in question. Even though snake biologists often decry these claims as exaggerated (usually because they are), Bradshaw wondered whether they are really very harmful. He suggested that people are generally more fascinated with animals that could kill us (even if they rarely do) than they are with entire groups of benign species, such as skinks or plethodontid salamanders, which are often considered boring (if a person is even aware of their existence). 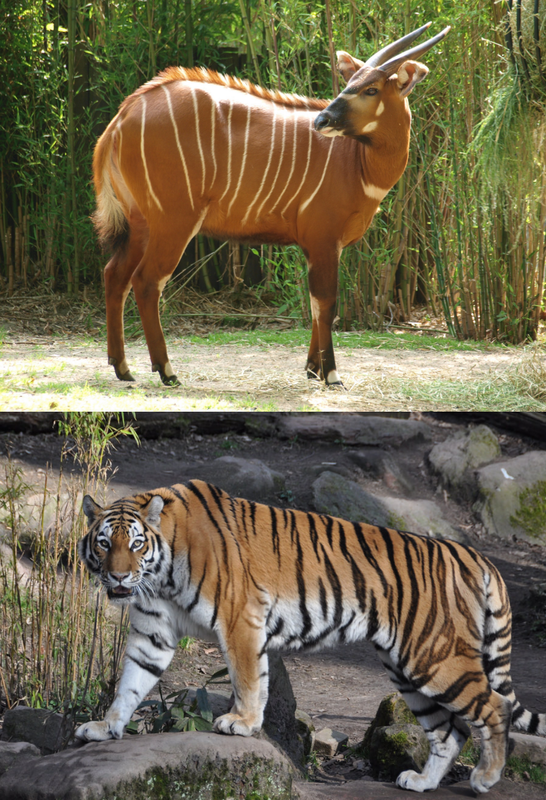 Compare tigers with, say, bongos. Both are critically endangered, inarguably gorgeous animals from exotic places. Tigers sometimes kill and eat people. Everyone knows a tiger. Most people think a bongo is a drum. Or, if you want a snake example, take rattlesnakes. Rattlesnakes are the Bald Eagles of snakes. They are distinctly North American. Everybody in North America knows them. One was on our flag. In contrast, the USA has never had a Smooth Greensnake (Opheodrys vernalis) on its flag, even though they are beautiful and North American and eat spiders. Perhaps the idea that any publicity is good publicity applies to conservation as well. 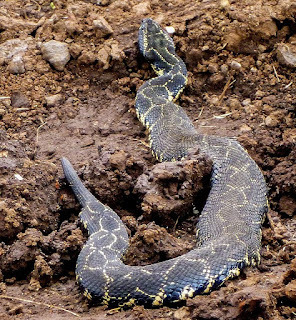 Then again, perhaps not—many residents of Massachusetts are needlessly worried about a Timber Rattlesnake reintroduction plan on an island in the Quabbin Reservoir, probably in part because of the bad PR that rattlesnakes get on a regular basis. If the Massachusetts Division of Fisheries & Wildlife were reintroducing Smooth Greensnakes, I doubt that most people would care (and it certainly wouldn't have been the subject of such venomous debate in the media). Indeed, Illinois's Lincoln Park Zoo is reintroducing Smooth Greensnakes in Chicago, and nobody is writing letters to the editor about it (and, in a way, that's a shame, because it's an interesting and worthwhile effort). Anyway, I wanted to give some well-deserved press to the two less-publicized new snakes. The blindsnake, Letheobia mbeerensis, is pink with tiny, barely visible eyes. It was described from a single specimen collected southeast of Mt. Kenya in April of 2014 by a local farmer, who found it while tilling his fields. This person, whose name was not known to the scientists who wrote the article, made a considerable effort to get the snake identified—he traveled 125 miles from Siakago to Nairobi, where he gave the specimen to the Nairobi Snake Park, who forwarded it to herpetologists at the National Museums of Kenya. 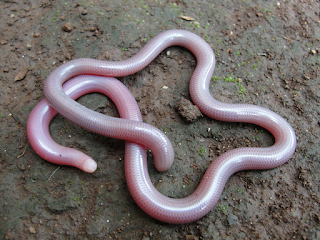 It is unique in having a relatively long tail (for a blindsnake), and in being found in a moist inland savanna. The other two Kenyan species of Letheobia, one of which was just described in 2007, are found in coastal lowlands with sandy soils. It is the 24th species of blindsnake known from Kenya, but I can guarantee that it won't be the last. The story of the new pipesnake is even more interesting, and I suspect the paper in which it is described will ultimately be the most read and most cited of the three snake papers in this issue. This is because, in addition to describing the new species, it contains "an overview of the tangled taxonomic history of C[ylindrophis] ruffus", a widespread species commonly known as the Red-tailed or Common Pipe or Cylinder Snake. The fourteen species of Asian Pipesnakes (family Cylindrophiidae) are secretive and semifossorial snakes with small eyes, bodies that barely taper at all, and ventral scales only slightly larger than or equal in size to their dorsal scales. Many have contrasting light and dark ventral blotching with conspicuous bright coloration on the underside of their short tail, which they expose when threatened. Scientific knowledge of these snakes predates modern biological nomenclature. One is pictured in Albertus Seba's Thesaurus, which was one of Linnaeus's main sources, although Linnaeus didn't include C. ruffus in either the 1758 or the 1766 edition of his Systema Naturae—instead, its first post-Linnaean description was written by Laurenti in 1768. Compared with other Cylindrophis, C. ruffus has a much larger distribution than any other species of Asian pipesnake. It's one of those species that is really a species complex—a group of closely related species that are very similar in appearance, to the point that the boundaries between them are often unclear. Other well-known examples include African House Snakes (Boaedon fuliginosus, formerly Lamprophis fuliginosus) and American Milksnakes (Lampropeltis triangulum). Often unusual populations of these species are described as separate species, but without extensive rangewide sampling it's easy to miss more subtle, clinal variation, especially when that variation is genetic rather than morphological. A recent revision of milksnakes split this wide-ranging species into several, and researchers have been working on African House Snakes as well. But no one has really examined Red-tailed Pipesnakes. Last year, a group of European and Indonesian researchers examined a large number of Cylindrophis museum specimens and discovered several specimens which did not fit any recognized species. But many of these specimens are old and some of their locations are uncertain. We don't have a lot of molecular data, and we have no specimens at all from many areas. And, no one has yet carried out a totally comprehensive review of the species complex (which really should encompass the entire genus, since the milksnake researchers found that some "milksnakes" were actually more closely related to mountain kingsnakes than they were to other milksnakes). Cylindrophis ruffus raising its tail "flag"
Despite its re-description in 2015, Cylindrophis ruffus is still a species complex that suffers from a lot of complexity. Its morphology is highly variable. Its geographic range limits are unsettled. There is no type specimen. The original type locality (“Surinami”) is a hemisphere away, obviously an error, which complicates decisions about which populations of C. ruffus should get to keep that name and which should change. The 2015 paper, as the authors of this month's paper delicately put it, "contain[s] some inaccuracies, including descriptive errors, which unfortunately increase the complexity of an already intricate taxonomic situation". The researchers state that they are currently undertaking the kind of comprehensive review that I called for above, but that in the process they discovered a morphologically distinct population from central Java, which they describe as Cylindrophis subocularis in this paper. But the real value of this paper, in my mind, is the step-by-step description of the history of this snake, starting with its first depiction in 1735 and continuing to present day. I'll leave the gory details for those who are really interested (the full-text is available here), but suffice it to say that the story of Cylindrophis ruffus is much more interesting than I ever knew (it took almost 100 years to get the geography right), and far from over. Thanks to M. A. Muin, Nigel Swales and Marcus Meissner for the use of their photos.